I was reading the last few chapters of the book of Proverbs today. (Don’t you just love reading Proverbs 31 and going, oh yeah, that’s me, ah, that’s not me, that’s me, that’s not me….) Then I flipped some pages over and landed on Jeremiah 36. I hadn’t read it in a while. In this passage, The Lord told Jeremiah to take a scroll and write on it the words He had spoken to him concerning Israel, Judah, and the other nations. God wanted to warn them that disaster was coming upon them if they did not turn from their sin, and turn back to Him. “Perhaps when the people of Judah hear about every disaster I plan to inflict on them, each of them will turn from his wicked way; then I will forgive their wickedness and their sin. While I was reading this, Baruch wrote them on the scroll jumped out at me, and I wrote it in the margin. I then noticed the book The Harbinger lying on my desk, and picked it up. If you haven’t read it yet, I recommend it. It is not the best-written novel of all time, but the information conveyed is invaluable. The book describes the attacks of September 11, 2001 as a warning and judgment on America. Seven years later, the crash of 2008, was the aftershock of 9/11. We know that 7 is a special number in God’s economy. 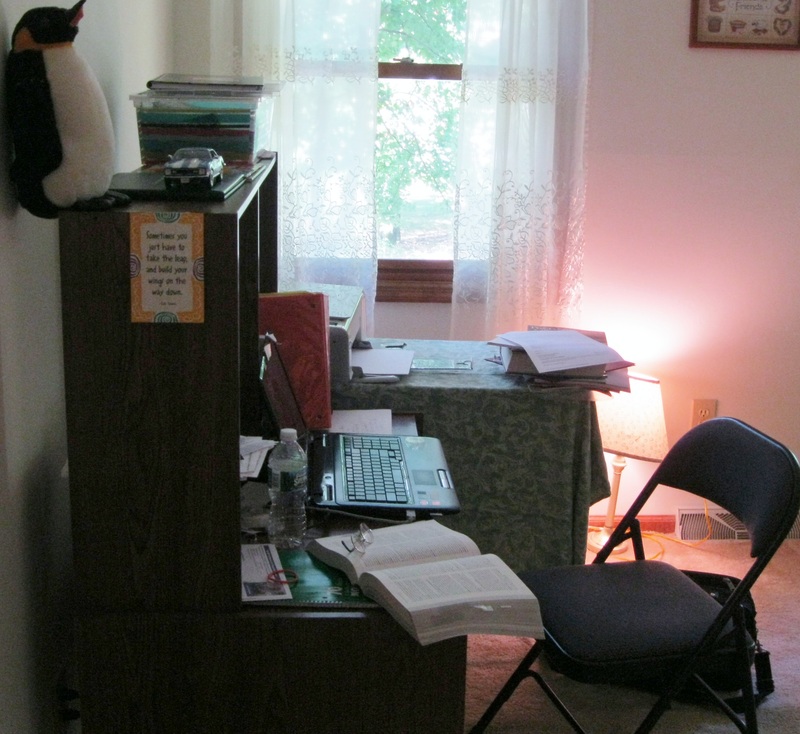 Well, I guess this is where I need to be today: at my messy desk, piled with books, notebooks, journals, half-written opinions and stories– the place where Jeremiah and The Harbinger met this morning. The name “Baruch” is so cool. I think I’ll name a character “Baruch” some day. Maybe soon. I don’t believe America is Old Testament Israel, either. If you read the book of Revelation, you see that the whole world is coming under judgement. God is a God of Love, and on the flip side of that is Justice. God poured out His wrath on Jesus on the cross. But that was not the end of it. The wrath is also coming on the earth. Because He IS Love, Justice must be served. Eph_5:6 Let no man deceive you with vain words: for because of these things cometh the wrath of God upon the children of disobedience. Think of it as a parent loves a child. If someone harms that child, like a sick child molester, that parent will seek Justice on behalf of that child. Is it judgement now or judgement later (afterlife)? If God is judging the USA then God must be judging every other country in the world. Does it look like that to you? I think you may be mixing up wrath and justice. Judgement happens both now and in the afterlife. Maybe He is judging all the countries now…. I don’t know intimate details of every country. I believe, from the Gospel, that God is doing other, kinder things.